A 2014 Edmunds survey showed that most auto intenders make at least two dealership visits and take at least two test drives before they buy. This investigative period is a critical time for automotive marketers. While shoppers show purchase interest and browse online, auto marketers can gather data about their in-market audiences to serve better ads. They can also go further than analyzing digital engagement to understand how ads affect an auto-intender audience. Ultimately, marketers need to understand how their ads affect offline behavior. So, how can marketers tie digital ad spend to showroom visits? And once it has been accomplished, how can this additional level of insight help deliver more effective programs? A major auto brand found answers to these questions through a controlled study of foot traffic to the dealership. The study used proprietary location-based technology to link mobile activity with offline store visits to measure advertising success. The results were informative, and also repeatable and scalable. This is good news for any auto brand looking to tie digital spend to showroom visits and, ultimately, sales. To understand how the campaign’s ads affected offline activity at the dealership level, the brand began by carefully choosing test and control groups based on similarities in behavior, interests, and locations. Over the course of the campaign, both groups were carefully observed (pre- and post-campaign) to normalize the data and account for aberrations—like events, promotions, and holidays—that could skew results. Finally, mobile impressions were matched to dealership visits to understand how the digital ads drove offline actions. The study revealed exposed visitors to the brand’s dealerships were in-market, also visiting competitors’ dealerships on the same day. Therefore, the brand learned it’s important to seal the deal before the client walks off the lot. Further, the manufacturer can conquest based on competitor locations with a high visit rate. Banks were also a common same-day destination. This indicates that on-site financing can be a valuable tool to help close the deal, and manufacturers can adjust ad creative to advertise on-site financing when available. 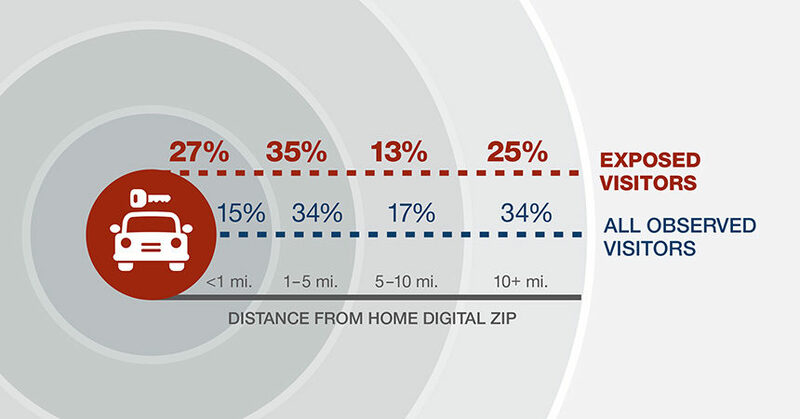 About 62% of visitors who saw an ad lived within a five-mile radius of a dealership. This suggests that promotions aimed at nearby, high-responding neighborhoods might need to be incorporated into future calendars. Insights like these put brands in the driver’s seat, positioning marketers to leverage real data and drive success. After this particular traffic analytics study, the auto manufacturer was able to share the insights with its dealers so that all tiers could better craft digital campaigns, promotions and special offers, pricing, and more. Conducting a traffic analysis provides deep knowledge of where auto intenders spend their time and money to deliver a complete customer picture. In the digital world, it’s traditionally been a challenge to tie online efforts and spend to offline behaviors, but that’s no longer the case—and isn’t that what digital marketing is all about? John King is the U.S. director of automotive advertising for MaxPoint, where he helps dealers reach the right consumers in the right neighborhoods across mobile and desktop devices. His expertise is in integrated media planning across mobile, Internet, TV, and print, with a focus on emerging media platform evaluation.